← Decarboxylation Marijuana Using Pressure Canner and Making Cannabutter. Six pawpaw fruit were taken off the ground under the Asimina triloba tree. This is the most collected on one day. So far this year ten fruit have been collected. It appears even green color the fruit is still sweet. There appear about 15 or more more to ripen. There are two trees. Delicious to eat, skin and all. 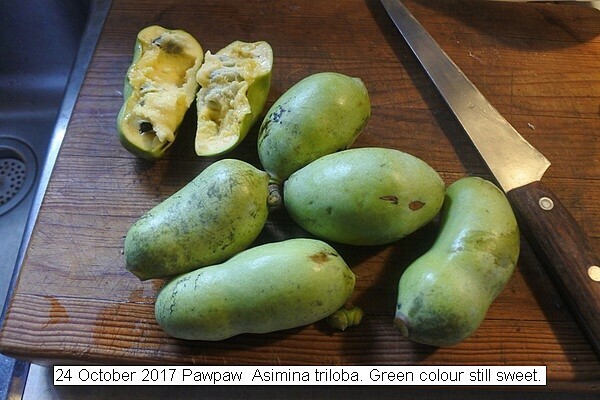 This entry was posted in Uncategorized and tagged 24 October 2017 Pawpaw Asimina triloba, Pawpaw (Asimina triloba). Bookmark the permalink.